There is approximately 50,000 miles of Interstate Highway in the United States.....filled with cars traveling at an average of 75 miles an hour. 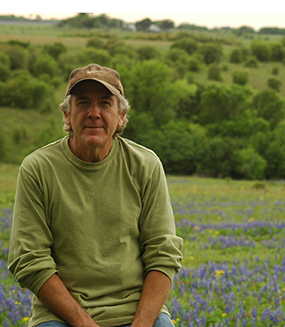 Several years ago I began driving the BACKROADS throughout Texas and the surrounding states - discover many fascinating places and people. 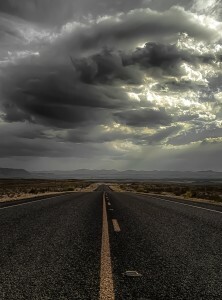 While traveling "off the beaten path" I have tried to capture the spirit of these forgotten roads in photographs. After sharing some of these journeys with folks I have met I've been encouraged to document my travels.........I invite you to FOCUS ON THE BACKROADS! "To often......I would hear men boast of the miles covered that day, rarely of what they had seen"
A ghost town is actually a site where evidence was left of a town’s previous existence. This can be in the form of abandoned buildings, ruins of old buildings, or simply an old cemetery. These are reminders of towns that once were inhabited by people full of life and dreams. As people moved westward in search of adventure and a better life, they built farms, homes, stores, schools, and churches. We have been told stories of the great western expansion. Of the cowboys, the miners, and the famous lawmen and outlaws. These folks have been depicted in books, on TV, and the big screen for years. The real heroes of this time were the homesteaders that settled and built towns and communities. Many of these have become our great cities of today while others are now abandoned and have become ghost towns. Most people speed by these towns missing out on a part of American history. You can visit these long forgotten towns and wonder what they must have been like in their heyday. Most of us are only a generation or two removed from ancestors that settled and raised their families in these towns. 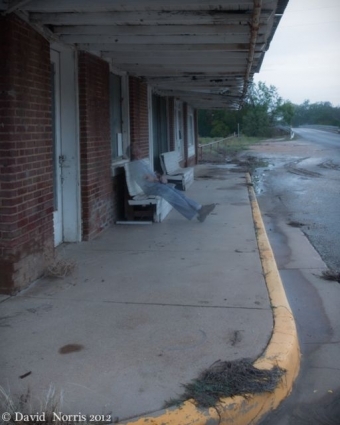 There are over 800 ghost towns in Texas. Some are a cross road or a long forgotten graveyard. Others, such as Terlingua, Gruene, and Luckenbach have re-invented themselves thanks to antique shops, chili, and music! You might wonder why someone would drive hundreds of miles to visit these long forgotten towns – well for the same reason that one would climb a mountain…because they are (were) there. 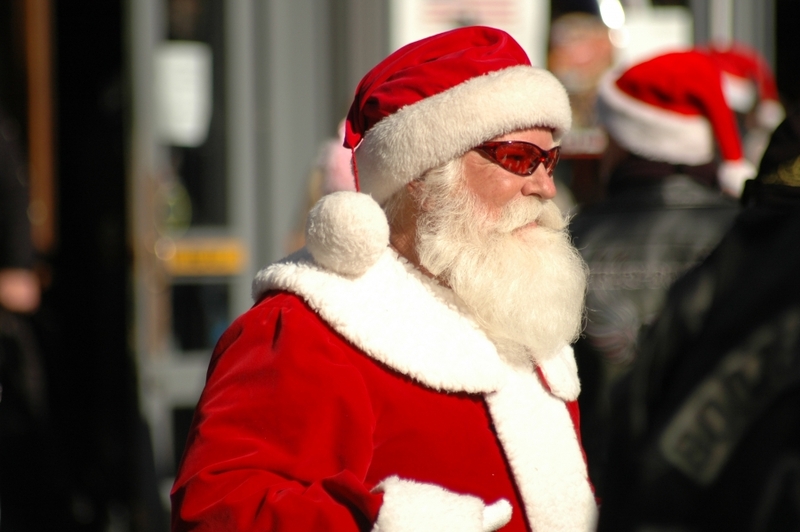 In 1897 eight-year-old Virginia O’Hanlon asked her father whether Santa Claus really existed. Philip O’Hanlon suggested she write the New York Sun – assuring her “if you see it in The Sun, it’s so” Virginia wrote Dear Editor: I am 8 years old. Some of my little friends say there is no Santa Claus. Papa says, If you see it in THE SUN it’s so. Please tell me the truth; is there a Santa Claus? 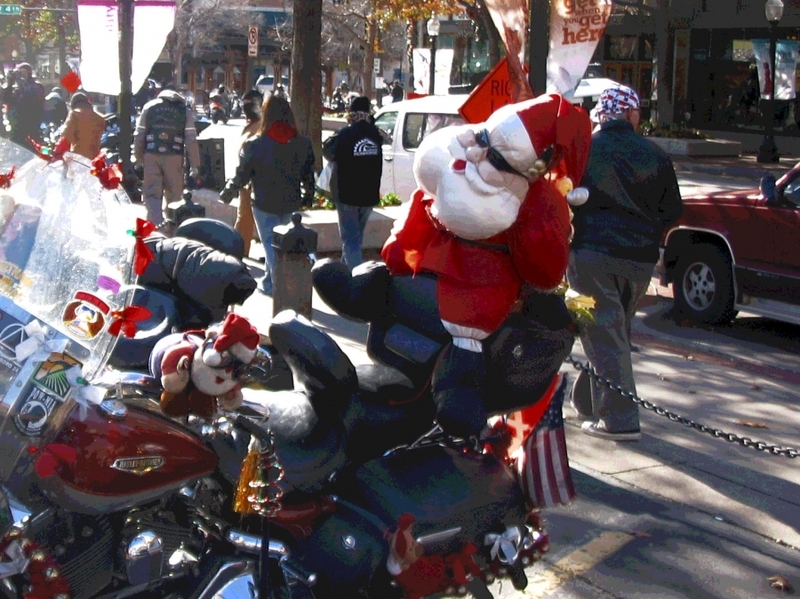 On September 21, 1897 newsman Francis Church responded in a printed editorial titled – Is There a Santa Claus assuring Virginia that yes there is a Santa Claus. I too have often wondered; if there really was a Santa Claus and if so what did he do during all the rest of the year. When I was a kid it was confusing when Christmas morning my brothers and I would find gifts left by Santa supposedly build by his elves at the North Pole…..but they came in box that said Wammo or Milton Bradley. For years I would lay restlessly in my bed at night wondering if Santa was real or was he a FRAUD. During a recent trip to the Dallas Farmer’s Market – I finally learned the truth! As I turned the corner to my surprise I was face to face with none other than old Saint Nick himself. When I spotted the wad of money in his hands I then realized why all my presents were not hand made by little men with pointed shoes – THEY RAN OUT OF TIME and Santa had to purchase additional presents at Montgomery Wards (pre-Toys-R-Us and Amazon). I also realized why every year Santa left us an orange in the bottom of our stocking every year – obviously there is a surplus of Florida Oranges at the North Pole! Utopia – imaginary place considered to be perfect or ideal. Utopia does exist in the Texas Hill Country. Is it perfect, probably not….but it is a great destination if you are looking for the perfect get away. 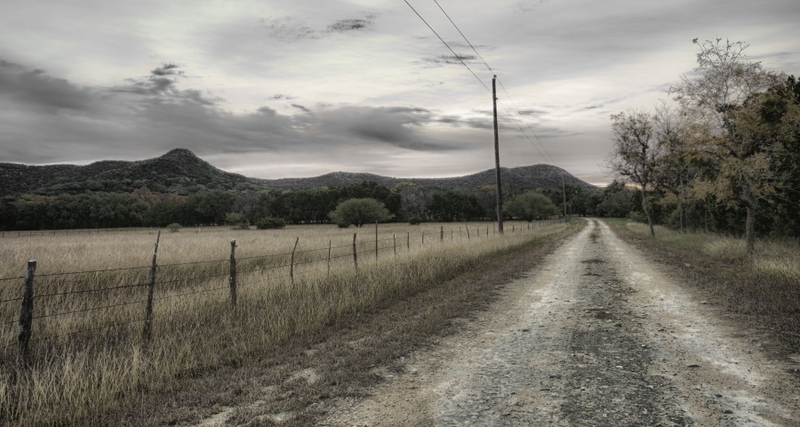 Located 85 miles NW of San Antonio, Utopia was settled in the early 1850’s. By 1880 the population was 150 people, there were two gristmills, a cotton gin, a blacksmith shop, a store, and three churches. Current population is 227. 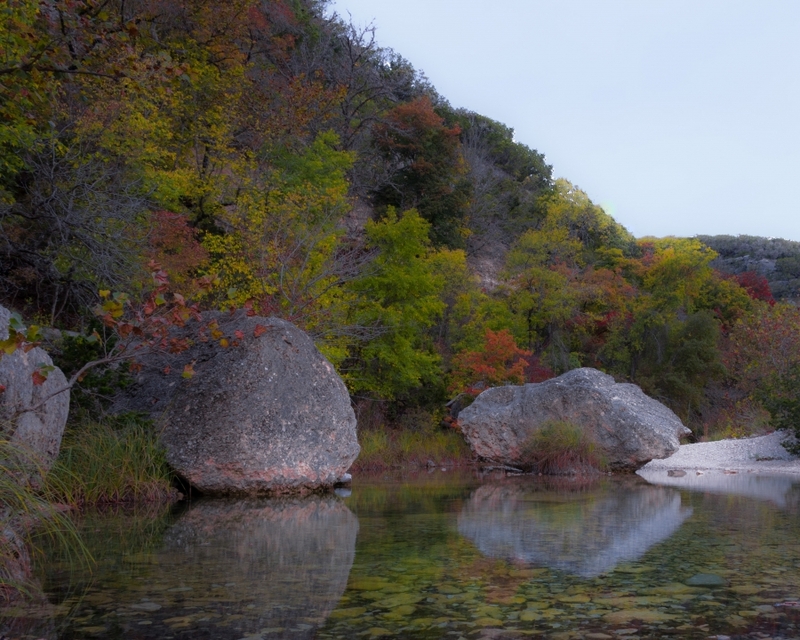 Lost Maples State Park is located about 10 miles west of Utopia. 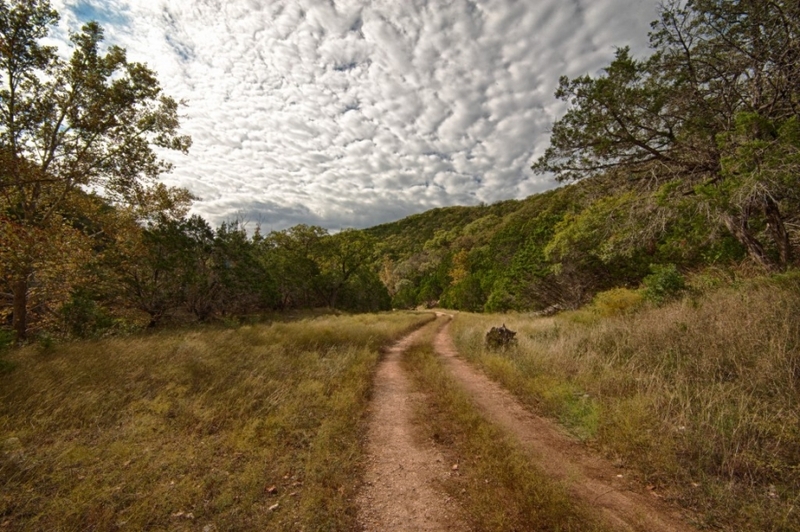 The 2,174 acres were acquired by the state of Texas in 1974 and the park opened in 1979. In 1980, it was designated a National Natural Landmark by the Heritage Conservation and Recreation Service. 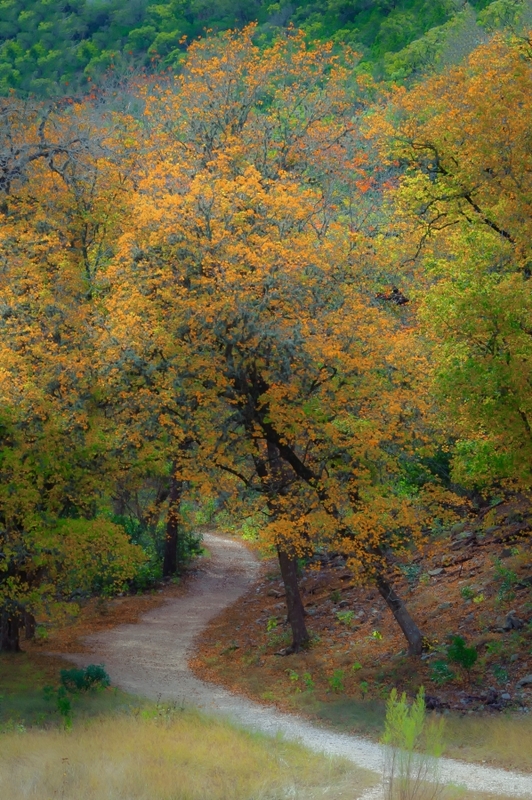 The park contains 11 miles of hiking trails, campsites, and primitive camping. It is bordered by the Sabinal River and contains two small lakes and several ponds. 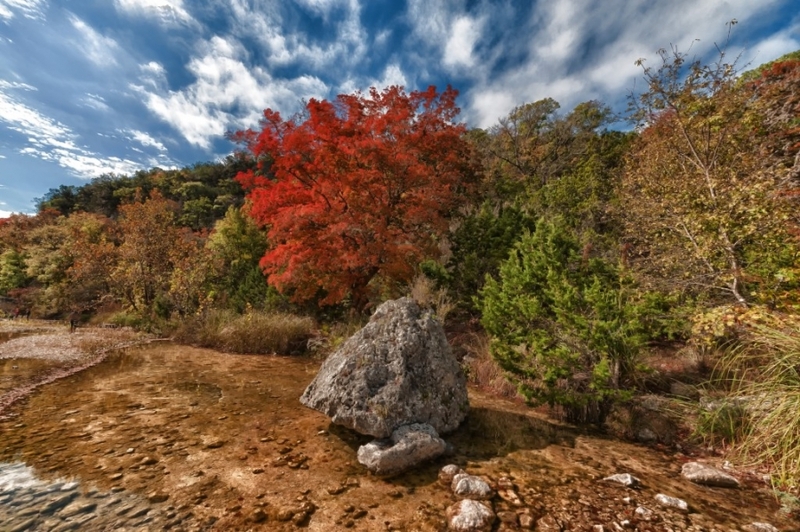 Lost Maples is included on many of the top 10 list for spectacular fall color which peaks in November. 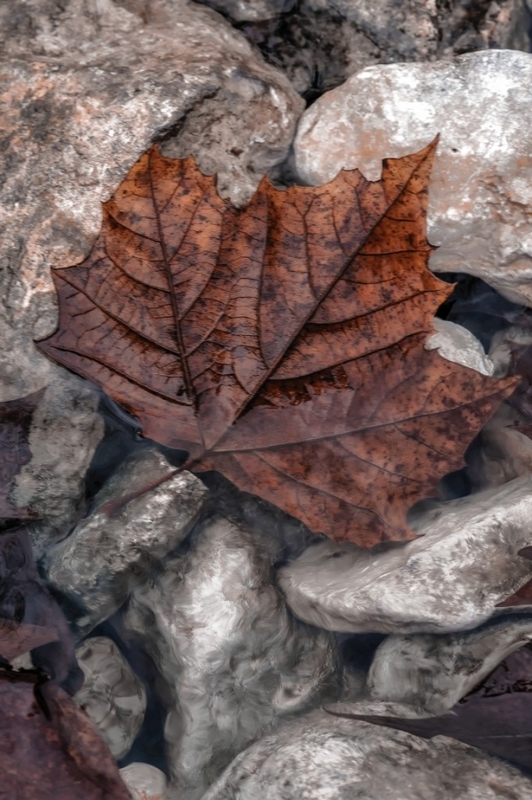 There are a large number of Bigtooth Maple trees within the native Ash, Oak, and Basswoods. 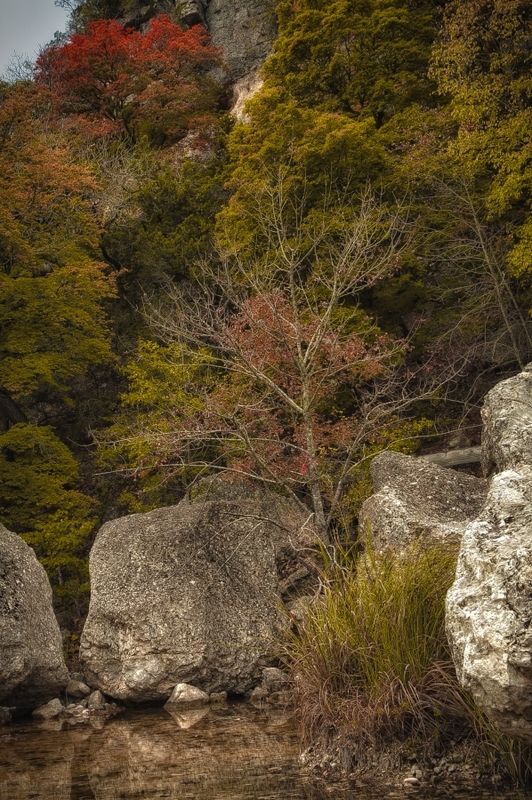 Utopia may be ‘imaginary’ but you can experience a glimpse of Utopia hiking the trails of Lost Maples. I would suggest contacting Fox Fire cabins in Vanderpool for lodging. A must is eating at THE LOST MAPLES CAFE in Utopia. Of course they are world famous for their pie! The Federal Aid Highway Act of 1956 was signed authorizing the construction of the Interstate Freeway System. By 2010 there were 47,182 miles of interstate highway costing close to $425billion to construct. Today most travelers speed “down the highway” stopping only to grab a hamburger or stop at one of the 2,500 rest areas along the interstate. Left behind are the “little used secondary roads” which for many years were the life veins of America. Many people wonder today if good old American Values still exist – they do – most folks do not slow down enough to see that they do. Only on the back roads of Texas can you find towns with emotional names such as Happy, Smiley, Comfort, and Friendship. Towns with names that will make you hungry like Bacon, Noodle, Oatmeal, Turkey, and Trout. Towns that you will swear you took a wrong turn like Memphis, Reno, Miami, Pittsburg, and Detroit. 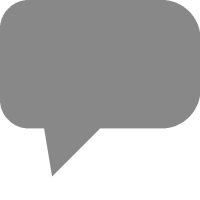 Towns that sound international but the people still talk with a Texas drawl such as Athens, China, Egypt, London, and Paris (Viva la Texas). Texas is even the center of the Solar System with towns named Earth and Venus. 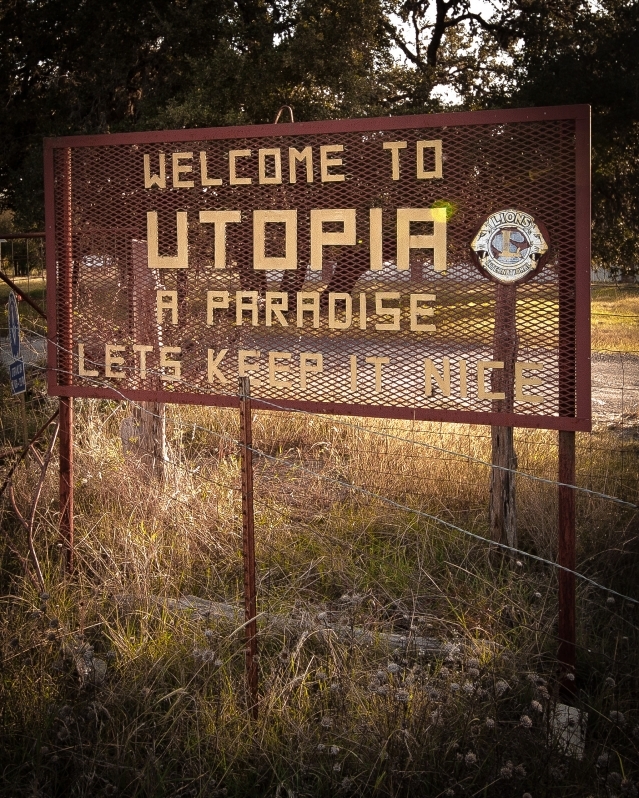 One of my favorite Texas town is the perfect little town of Utopia – only in Texas can you find Utopia. Each of these destinations is special. It may be the history, it might be the people, or it might be the little cafe on the corner that serves the best pie in the world (every small Texas town has one of those cafes). These are the reasons that make me WANNA TAKE THE BACK ROADS!